House mice are the most common rodents encountered in the United States and are worldwide in distribution. Rodentologists (people who study rodents) consider the house mouse a mammalian weed and claim it is the second most successful mammal on earth, only behind humans. House mice are small, secretive mammals that often live unbeknownst with humans until their droppings (feces) are found in out-of-the-way places, such as cabinets, behind appliances and in dark, shadowy corners. These are small, usually gray rodents that are between 2.5 and 3.75 inches long with weights between 0.5 to 1.0 ounce. They deposit thousands of micro-droplets of urine and 50 to 75 droppings per day. They have a three week pregnancy period with an average of five offspring per litter. Female mice can produce 6 to 10 litters in a lifetime. They prefer grains, seeds and insects as food sources but will consume almost any food. They consume 1/10 of an ounce of food per day. 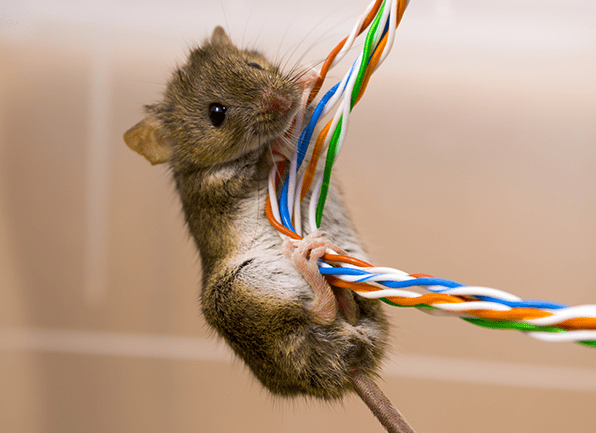 House mice tend to nibble on objects, including electrical wires, which can result in fires. They can squeeze through cracks and gaps that are 3/8 of an inch in diameter. Most mice live less than one year. Place dog food, birdseed, and human food inside rodent-proof containers. Keep shrubs, vines and tree limbs trimmed away from the structure. All gaps should be less than 1/4 of an inch to prevent entry. Door thresholds and frames should be fitted with gaskets or brush shields. Utility openings should be sealed with sealant or pipe collars (escutcheon plates). Do not use expanding foam to seal openings, as mice can chew through it. Do not stack lumber, firewood, bricks, pipes or other debris next to the foundation. Vents (attic, crawl space, and dryer) should be covered with mesh screens (< 1/4-inch). Storage areas should be organized and clutter-free, with access to perimeter walls. Garbage should be removed daily and stored outside in closed containers. Food spills and soiled dishes should be cleaned promptly.